Recently, my husband and I have been struggling with the reality that, in just a few days, our youngest daughter will be moving to Tennessee. She will be a transfer student at University of Tennessee. Our girls are in their 20s (Abby, 23 and Megan, 21) and have moved in and out of our house a couple of times. Yet, now that Abby has graduated from college and is in a job search outside of the St. Louis area and Megan is moving seven and a half hours away, we can no longer deny that our girls are young adults. Of course, as a parent, this is what you are always working towards, helping your children become self-sufficient adults. Even though you feel like they belong completely to you, they do not. The truth is: they never did. Children are on loan from God. They belong first to the Author and Creator of life. They are children of God who have been gifted and entrusted to us in order that we might teach them and help them grow. Their story is a part of our story. Yet, we must also understand and accept that they have always been and will continue to live into their own story. I have been thinking about how much this relates to the church as well. Often we think and act as if the Church belongs to us. We claim and live out the misconception that the "Church" is ours. To back this claim, we tell of how long we have been a part of a local church. Perhaps, we even talk about how many generations back our family has been members or how we were born, baptized, confirmed, and married in a particular church. All of this may be true, but it does not give us any more claim or ownership to a church. In fact, none of us have true ownership of any church. We may have a deep investment, but this does not mean we have any more rights and privileges than any other member. The local church and the Church universal do not belong to us; we belong to it. 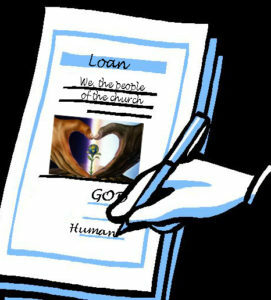 The Church is on loan to us. However, we must always remember first, it belongs to Christ. The Church has been gifted to us. It has been entrusted to us in order that it may grow and flourish. We are the stewards and caretakers of this incredible gift, not gatekeepers. The Church is not a noun, but rather a verb. It is intended to help raise up each generation, so that each person may know and experience his/her own relationship with God. New members in our churches and new generations in our Church are part of our story. Yet, we must also understand and accept this story will inevitably have new elements, new settings, new characters, and new developments. The Church is a living, breathing continuation of the story of God and God's people. May we be able to accept and adapt when part of the story changes. May we also be able to celebrate the new chapters that are yet to be written.